It seems as if it was only a blink of an eye ago that we were soaking up the heat of the Summer and now it feels as if Fall is in full swing. 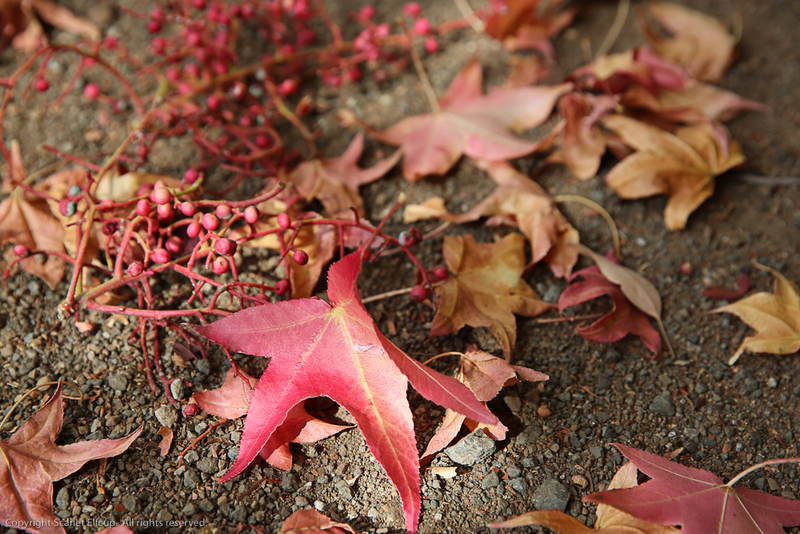 Around here, leaves have begun to turn and fall, pumpkins readily greet visitors at the local markets, pomegranates are in season and skies are darker and cooler. As such, I hear the call of some old friends from the woods. If you were around this time last year, you remember the story behind the creation of The Owl and the Pussycat. As it turned out, I loved these creatures oh so much that I went on to call upon more of them and that's when the critters came around to celebrate the coming of Fall. This year, I needn't call upon them for they came out all on their own. Reader, meet the first of this year's Fall Critters, Mia and Winston, creations inspired by Scarlet Elfcup's The Owl and the Pussycat playset. Winston is an 8" (20 cm) doll, made with natural materials. His facial skin is made with premium quality swiss cotton jersey and his body/bodysuit is composed of clean, repurposed 100% cashmere (makes him ultra soft). He is softly stuffed with bio-wool and weighted with non-toxic, washable stuffing beads. His owl bodysuit is permanently sewn on, but his hat is remove-able to reveal a sweet head full of brown hair. His hair is made of mohair yarn. His owl hat has buttons for the eyes and a piece of printed fabric for the nose. He has an embroidered and simple, expressionless face. His cheeks and nose are blushed with red beeswax. His wings are embellished with pretty cuts of individually-shaped fabrics sewn and then stitched to the wing. His feet are lined on one side with a cotton fabric printed with beautiful words of wisdom. Mia, like her pal Winston, is an 8" (20 cm) doll, made with natural materials. Her facial skin is made with premium quality swiss cotton jersey and her body/bodysuit is composed of clean, repurposed 100% cashmere, making her ultra soft to hold and cuddle. She is softly stuffed with bio-wool and weighted with non-toxic, washable stuffing beads. Her kitty bodysuit is permanently sewn on, but her hat is remove-able to reveal a head full of golden locks. Her hair is made of mohair yarn. 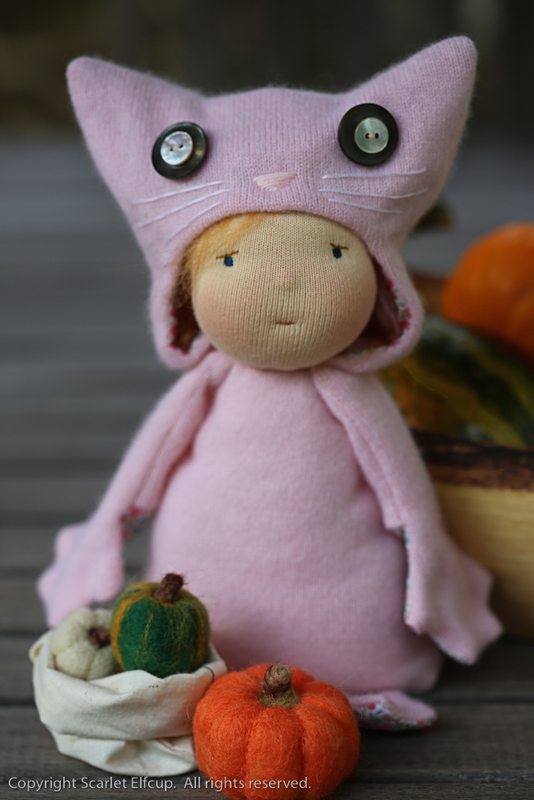 Her kitty hat has buttons for the eyes, a nose that is embroidered and whiskers made of embroidery floss. 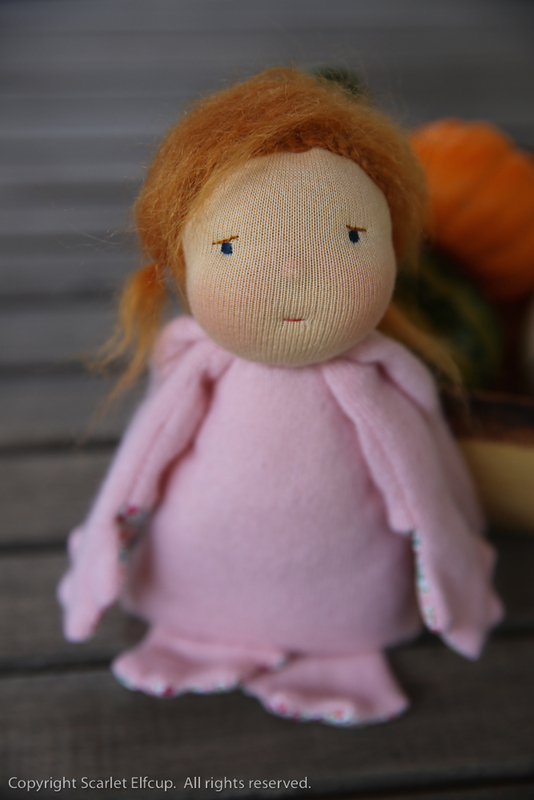 She has an embroidered and simple, expressionless face. Her cheeks and nose are blushed with red beeswax. 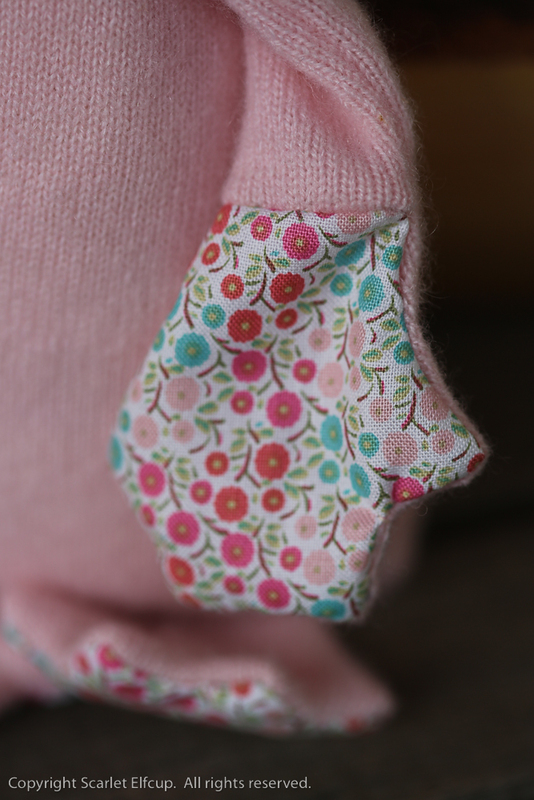 Her kitty hands and feet are lined on one side with a playful and colorfully printed fabric. Winston and Mia each come carrying a cotton muslin sack filled with Fall harvest...a small batch of three needle felted pumpkins. One of my favorite parts about making the Fall Critters is the needle-felting of the pumpkins. There is an endless array of color combinations and types of squashes and pumpkins to be had for the fun, not to mention the variety of textures and shapes for the making. The pumpkins are made with 100% wool roving and clean carded wool. And they range in size from 1 inch to 2 inches wide and tall. IMPORTANT NOTE: Due to the delicate nature of their design and the small parts on them that pose as choking hazards for young children, Winston and Mia are recommended for ages 8+. If you are interested in bringing Winston and/or Mia home to celebrate the start of a wonderful Fall season, they will be at Dollectable on October 1, 2015 at 7:00 PM (EST). This is a good opportunity to bring home these ultra soft and pudgey friends for a special value of $65 USD each. If they are still available after the Dollectable upload, they will be moved to the Scarlet Elfcup Etsy shop and will be available in the shop at retail value.